New to my candle collection. | gingerbread smiles. For anyone who doesn't already know this, I'm obsessed with candles. I honestly have a cupboard full of different scented candles and whenever I'm out shopping I always seem to add another candle to my basket to join the others. Candles make the room feel so cosy, homely and warm. I've got a number of different scents including sweet and fruity but also I have a lot of plain ones like small pillar and tea lights for burning amongst the smelly ones. So recently when I've been out and about Christmas shopping these few candles have found their way to my house. I thought I'd do a run down of the new scents I've picked up in case you are as obsessed as me! I can't wait to start burning them all! At £29.00 this is quite an expensive candle, especially compared to the other candles in this post but the smell was so alluring that I had to get it. I will add I bought this on black Friday so there was 25% off! Bargain. Myself and Mum first smelt this at the Crabtree & Evelyn at Dalton Park. I was drawn to the shop due to the cute gingerbread graphics they have on their Christmas packaging. It was actually Mum who said she might buy this first, but we decided to leave it at Dalton Park due to the cost. When we were out at Leeds on black Friday and it was discounted we thought it the perfect opportunity and both picked one up! Unlike normal spicy Christmas candles this is lovely and sweet. Due to the clementine it has a lovely undertone of orange with a hint of spice from the clove, nutmeg and cinnamon. Crabtree & Evelyn approximate that this will burn for 50 hours, so that's a good bit of time for the price! I haven't burnt this one yet, I think it might be one for Christmas day! I LOVE anything that smells like parma violets. For my birthday I received the Diptique Violet candle and I love it. This is really just a cheaper, sweeter version of it. Like all Lily-Flame candles it has the chunky pieces of wax on the top making it very aesthetically pleasing and the smell is just amazing. I seriously can't wait to burn this and I feel like I need to stock up on it already. I bought this one from the Avon catalogue after scratching and sniffing the scent on the page. It was half price at the time which was great so I snapped it up. It comes in a cute little tin with red labelling making it feel very festive. Its a very warming Christmassy scent with definite hints of spice but it isn't too overpowering as I think it has a slight hint of orange. It's a great Christmas candle for people who can't handle too much spice. Our Own Candle Company: Smell My Nuts, Mmm...Nice Melons, Mulberry - Large: £9.99 & Small: £3.99. When we visited Wynyard Hall's Christmas Fair this year there was two stalls selling these beautiful candles. I'm pretty sure I got one of these last year at the fair but I can't remember what scent. They come in these cute jars with screw top lids which are perfect for storing. The scents are as follows: Smell My Nuts - This one is gorgeously sweet with a hint of nut. As it's a three scent candle with Banana Nut Bread, Toasted Coconut and Hazelnut, I'm sure it will change as the candle burns down. Mmm..Nice Melons - This is another three scent candle with Watermelon, Canteloupe and Honeydew Melon. This one is very fruit and sweet smelling just how you know a melon to smell. These large candles last for up to 100 hours so I'm sure the scent will change as I burn through the whole jar! Lastly I got a small Mulberry as this was the only size they had left in this scent. This one is a more of Christmassy scent, distinctly smelling like berries but less fruity than normal. It is understated but gorgeous. I bought this one from a Spring fair earlier this year and it quickly became one of my favourites. When I found out the stall was going to be at a Christmas fair we were attending this year I knew I had to stock up so I bought two! I can't remember how much they were, and the lady that runs the shop doesn't do online sales so I can't find the price. These candles are mostly sold at markets so there isn't somewhere I can go and pick one of these up which makes me sad. They are super great quality, packaged in a lovely glass jar. The smell of this one, pink grapefruit and mango, is very fresh but also quite fruity. 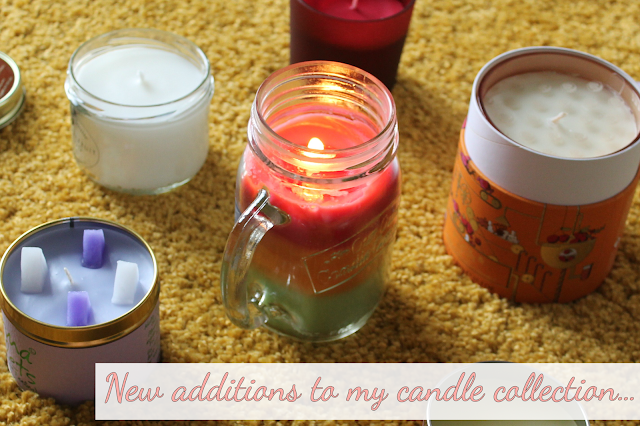 So do you like the sound of any of my new candles? Which one do you think would be your favourite?